Separated from its community by a busy dual carriageway built in the late 1960’s, the members of St John’s have nevertheless consistently sought to make their building a centre for local outreach and activity, and has gradually succeeded. 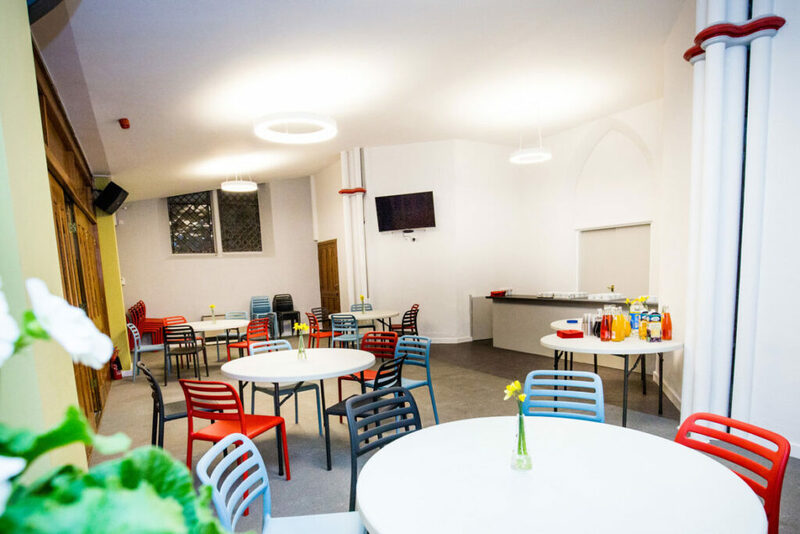 Modifications were made to the building in 1993, however, full access was never accomplished and, over the past 25 years, community services have continued to be delivered from the church hall; an ageing pre-fabricated building from the 1970s. St John’s Bowling understands the needs of the local community well, but had reached a plateau in its response because the programme of services was overwhelming the buildings’ capacity. Clearly the whole site needed to be re-imagined and re-designed. Architects services needed to be engaged. permissions achieved as a Grade II listed building. Substantial capital funding was needed. The sustainability of the site and the Community Hub had to be secured and evidenced. In 2014, we begin the process of making the Hub a reality. £550,000 was successfully raised through Reaching Communities to cover the building and architect’s costs, legal costs, the expansion of the carpark and two years of running costs, along with salary costs for a part-time Community Hub Coordinator. St John’s Bowling Hub opened in January 2017. It is accessed daily by people of the community, church members, and other local service providers. A new entrance, providing full disabled access has been achieved and the expanded carpark allows closer vehicle access. New toilet facilities, a reception area, catering kitchen, café area and the full redecoration of the building combine to make St John’s Bowling Hub fit for purpose as an essential community asset. Futurekraft have that great combination of expertise insight and faith. We have benefitted greatly both in our development thinking and in the resourcing that has followed. Now that the St John’s Bowling Hub is officially open, all services are delivered from one building with room for an active and expanding programme of activities. The dilapidated church hall is vacant and available for re-development as part of the future of the whole site.